Last month marked the 100th anniversary of the Great October Revolution, whereby the Bolsheviks in Petrograd overthrew the Russian government and took power. Immediately after, the Revolution’s leader, Vladimir Lenin, consolidated his rule by suppressing competing political parties; withdrawing Russia from World War I; and fighting a bitter Civil War. By the early 1920s, the country had obtained a modicum of peace, albeit isolated from the rest of the world. Through wars and purges, technological advance and political suppression, the Bolsheviks, renamed the Communist Party, held control in Russia for almost 75 years. Margaret Bourke White, “In a Hospital Waiting Room, Moscow,” 1932. Red Medicine, endpaper. Lenin was aware of Russia’s backwardness compared with the West. He saw Communist rule as a way to make up for that deficiency. His oft-cited definition of communism made this belief explicit: “Communism is Soviet power plus the electrification of the whole country.” Soviet power meant political rule that flowed from ostensibly democratic workers’ councils (the Russian word for “council” is “soviet”), with the aim of basing governance in the working class; electrification meant providing the latest means of technological development. Soviet rule and technological development, together, would enable the country to leap-frog its capitalist neighbors and become the vanguard for humanity’s future development, both social and economic. By the 1930s, as the United States and Europe slid into the Great Depression, Soviet Russia was held out as a more workable and more equitable society than those in the West. In the field of medicine and public health, two observers set out to see if that were true. Sir Arthur Newsholme (1857–1943), and John Adams Kingsbury (1876–1956), a Briton and an American, traveled through the Soviet Union in August and September 1932. Their account was published the following year as Red Medicine: Socialized Health in Soviet Russia. “Itinerary of the authors, who traveled 9,000 miles within Soviet Russia.” Red Medicine, p. 19. Soviet Photo Agency, “Traveling dental station in rural district near Moscow,” . Red Medicine, p. 223. Did the Soviet experiment work? The new system of medicine and public health was initially very successful in dealing with infectious disease and extending care more widely through the country. Nonetheless, as Newsholme had envisioned, the initial impetus could not be sustained. Fifty years after Red Medicine, the system was broken; while citizens could usually get access to health care, quality lagged. After the collapse of the Soviet system in 1989–91, the new Russian government attempted reform and adopted a mixed public-private economic model, mandating compulsory health insurance while continuing a guaranteed right to free care. Fifteen years on, though, an OECD report concluded that “Russia continues to struggle with a health and mortality crisis.” One could fairly state that our country faces such as crisis today as well, and in both cases, the resolution is yet to come. A note: Red Medicine includes several photographs by noted photojournalist Margaret Bourke-White, taken during her own 1932 trip to the Soviet Union, and provided freely to the authors for their use. Yes, it took place in November! In 1917, Russia still used the Julian calendar, according to which the day of the Bolshevik coup was October 25. The rest of the West, using the Gregorian calendar, called that day November 7. Most of Catholic Europe had switched to the Gregorian calendar in 1582, with the Protestant countries adopting it in the 17th century and the British domains in 1752. Russia made the change in early 1918, one of the last countries in Europe to do so. Newsholme was an eminent British public servant and advocate of state intervention in public health, while Kingsbury, a Fellow of The New York Academy of Medicine, was formerly Commissioner of Public Charities for New York City, and at that time, Executive Director of the Milbank Fund, a foundation supporting research in health policy. See “Sir Arthur Newsholme, K.C.B., M.D. (LOND. ), F.R.C.P.,” American Journal of Public Health 33(8) (August 1943): 992–94; John M. Eyler, Sir Arthur Newsholme and State Medicine, 1885–1935, Cambridge History of Medicine (Cambridge: Cambridge University Press, 1997); Arnold S. Rosenberg, “The Rise of John Adams Kingsbury,” The Pacific Northwest Quarterly 63(2) (April 1972): 55–62; “Biographical Note,” The John Adams Kingsbury Papers, Manuscript Division, Library of Congress, accessed November 7, 2017. Sir Arthur Newsholme and John Adams Kingsbury, Red Medicine: Socialized Health in Soviet Russia (Garden City, NY: Doubleday, Doran, 1933). Note that, despite the title, the work was about more than Soviet Russia. The two men’s travels took them to the Georgian and Ukrainian Soviet Republics as well. This work was conceived as in some ways completing Newsholme’s previous three-volume survey of medical practice in Europe, which he undertook with the support of the Milbank Foundation: Medicine and the State: The Relation between the Private and Official Practice of Medicine, with Special Reference to Public Health. London, Baltimore: George Allen and Unwin, Williams and Wilkins; 1932. The Academy Library holds the third volume. Newsholme and Kingsbury, Red Medicine, “Concluding Observations” (for this and subsequent statements). Frank H. Hankins, “[Review of] Red Medicine: Socialized Health in Soviet Russia. By Sir Arthur Newsholme and John Adams Kingsbury,” Social Forces 14 (1) (1 October 1935), 155–56, accessed November 7, 2017. Hankins (1877–1970) was a prominent American sociologist. William Tompson, “Healthcare Reform in Russia: Problems and Prospects,” Organisation for Economic Co-operation and Development, Economics Department Working Papers, No. 538 (Paris, January 15, 2007), 5. Gary D. Saretzky, catalog for “Margaret Bourke-White in Print: An Exhibition at Archibald S. Alexander Library, Rutgers University, New Brunswick, New Jersey, January–June 2006,” item 23, Red Medicine, accessed November 7, 2017. 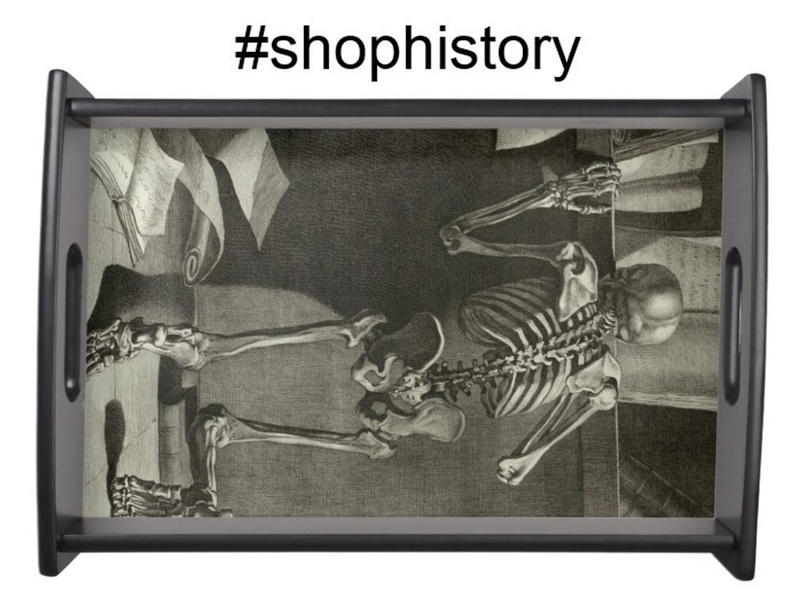 Today we have part two of a guest post written by Dr. Jaipreet Virdi-Dhesi, the 2016 Klemperer Fellow in the History of Medicine at the New York Academy of Medicine and a SSHRC Postdoctoral Fellow in the Department of History at Brock University in St. Catharines, Ontario. She is working on her first book, Hearing Happiness: Fakes, Fads, and Frauds in Deafness Cures, which examines the medical history of hearing loss and “quack cures” for deafness. Some of these cures are explored on her blog, From the Hands of Quacks. You can find her on twitter as @jaivirdi. Otologists claimed individuals needed to take responsibility for their hearing—to conserve what hearing one had, through proper diet, lifestyle, and hygiene, before it disintegrated. This was a remarkable shift from the 1920s “prevention of deafness” campaigns that concentrated on a screening program of early detection and medical care. While constant surveillance was still promoted, the late-1930s campaigns transformed hearing loss into an affliction that could easily be treated or managed by good habits. 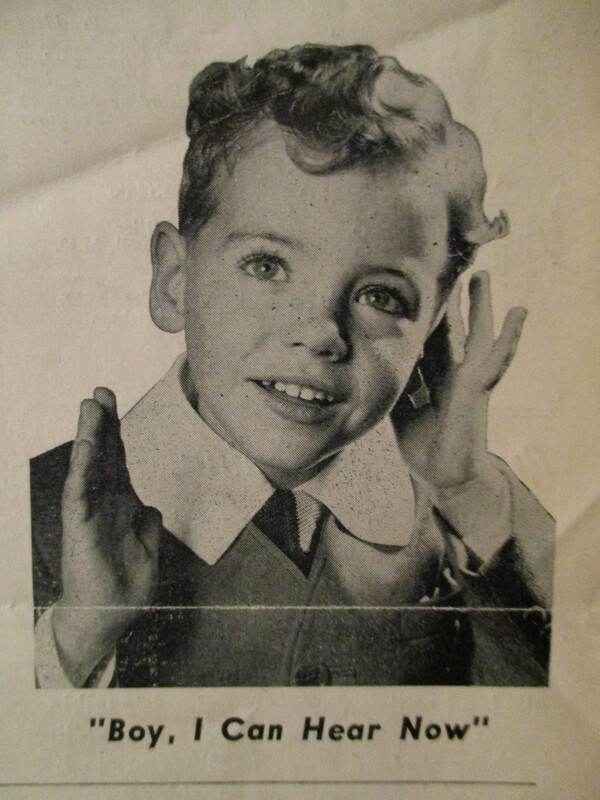 Pamphlets reveal how parents were encouraged to become more “ear-minded” toward their children, that is, to pay attention if their child exhibits any signs of hearing loss, to avoid a circumstance in which a neglected hearing issue ends up turning a deafened child into a problem. Advertisement for the New York League Hard of Hearing (The Bulletin, 1934). The American Society for the Hard of Hearing also launched their own campaigns. In 1937, the organization listed a four-point program publicizing their mandates: the prevention of deafness, the conservation of hearing, the alleviation of social conditions affecting the hard of hearing, and rehabilitation. In addition to popular radio broadcasts on the National Broadcasting System, 327 feature articles and 189 editorials were released in over 1600 newspapers. 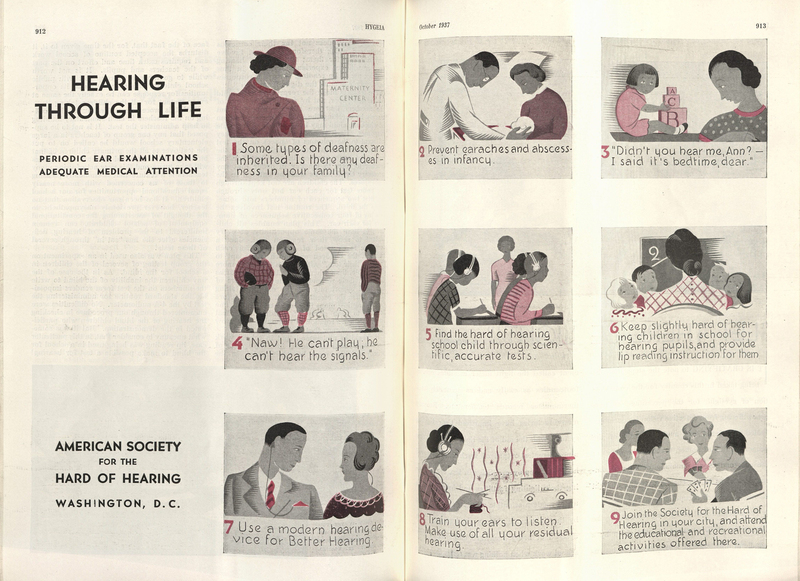 “Hearing through Life,” a national campaign launched by the ASHH (Hygeia, October 1937). Special thanks are owed to Arlene Shaner at the NYAM Library for her generous research assistance and lively conversations. Samuel Zwerling, “Problems of the Hard of Hearing,” Hearing News (January 1938). Bulletin of the New York League for the Hard of Hearing, 18.7 (November 1940). Today we have part one of a guest post written by Dr. Jaipreet Virdi-Dhesi, the 2016 Klemperer Fellow in the History of Medicine at the New York Academy of Medicine and a SSHRC Postdoctoral Fellow in the Department of History at Brock University in St. Catharines, Ontario. She is working on her first book, Hearing Happiness: Fakes, Fads, and Frauds in Deafness Cures, which examines the medical history of hearing loss and “quack cures” for deafness. Some of these cures are explored on her blog, From the Hands of Quacks. You can find her on twitter as @jaivirdi. The notion of deafness being statistically worrying as a public health issue actually dates to the late nineteenth century, especially to the work of otologist James Kerr Love of Glasgow. Love conducted several statistical studies of the ears of deaf schoolchildren, discovering that the majority of them were not completely deaf, but had some level of “residual” hearing. With proper medical treatment, the hearing could be intensified enough to warrant a “cure.” For other cases, children could be taught to make use of that residual hearing through invasive training using acoustic aids and other kinds of hearing technologies. Love’s research concluded that many deafness cases could actually be relieved if the ears of children were examined early and frequently—that is, deafness could be prevented. His “prevention of deafness” concept was influential for the new generation of otologists in America, especially those who were members of the New York Academy of Medicine’s Section of Otology during the first three decades of the twentieth century. To raise awareness on the necessity of proper medical examinations and frequent hearing tests, these otologists collaborated with social organizations such as the New York League for the Hard of Hearing, which was established in 1910. The League was a progressive group catering to the needs of hard of hearing or deafened persons who were raised in a hearing society rather than in a D/deaf community and communicated primarily with speech and lip-reading rather than sign language. Composed mostly of white, middle-class, and educated members who lost their hearing from illness, injury, or progressive deafness, the League strove to construct hearing impairment as a medical issue. They argued hearing impairment was not an issue of education or communication, but rather a handicap. The collaboration between New York otologists and the League eventually created a national network of experts, social services, teachers, physicians, and volunteers who banded together to address the so-called “problem of deafness.” That is, the problem of how to best integrate the hard of hearing, the deafened, and to some extent, even the deaf-mutes, into society. 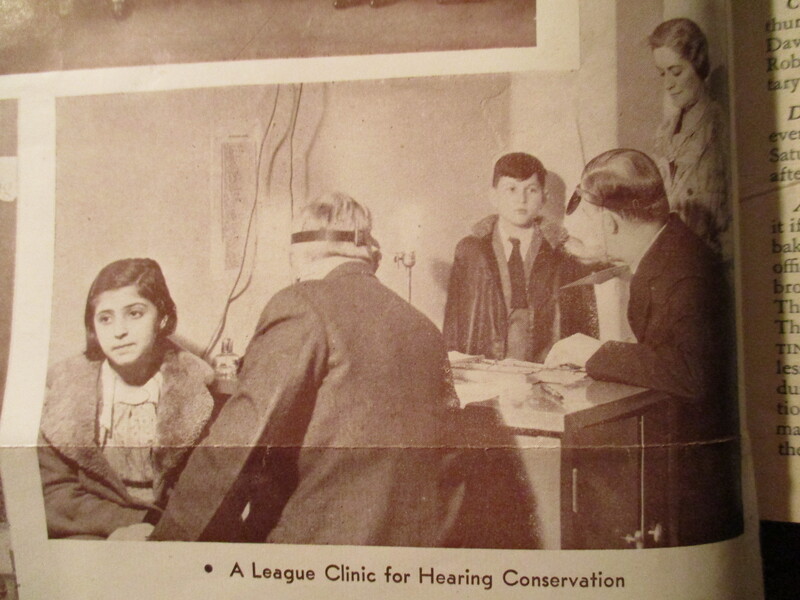 One key achievement of the League was the establishment of hearing clinics to properly assess hearing impairment, especially in children, to ensure medical care could be provided before it was too late. This project was primarily spearheaded by Harold M. Hays (1880-1940), who was recruited as president of the League in 1913, becoming the first active otologist collaborating with the League. After the First World War, Hays set up a clinic for treating hearing loss in children at the Manhattan Eye, Ear, and Throat Hospital. 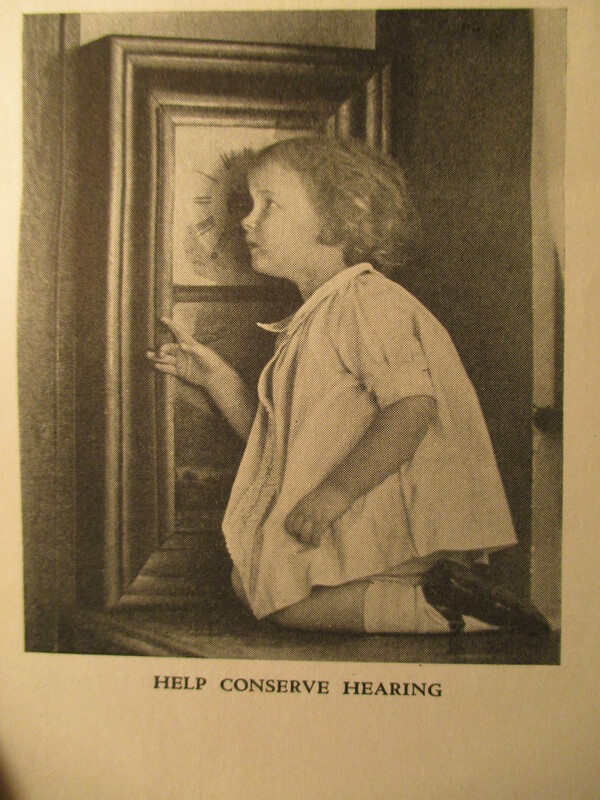 During the 1920s, Hays’ activism for regular hearing tests was so instrumental that in 1922, the League’s newsletter, The Chronicle, told its readers “we believe that the League would justify its existence if it did no other work than to prevent as much deafness as possible.” To achieve this mandate, the League launched a large public campaign to raise awareness on the importance of medical care. Indeed, in one report for the League, Hays remarked that with the increased publicity, there were 10,000 calls to the League in 1918 alone inquiring about aural examinations. A steady increase in patients would follow: 17 clinic patients in 1924, 326 in 1926, and then 1,531 in 1934. Another publicity campaign spearheaded by the League was the establishment of “Better Hearing Week” in 1926, a week-long awareness program (later renamed “National Hearing Week”). Held in October, the campaign included symposium discussions on the “Problems of the Hard of Hearing,” including topics on the relationship between the physician and his deafened patient, how the deafened could build their lives, and even on newest technological developments in hearing aids. 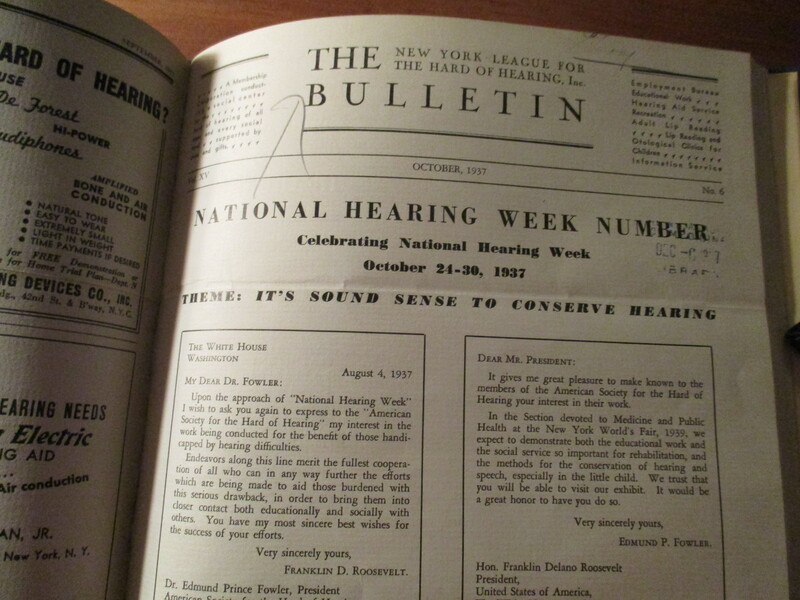 October issues of The Bulletin (the renamed League newsletter) and the Hearing News, the newsletter of the American Society for the Hard of Hearing (ASHH) included reprints of letters from prominent leaders supporting the mandates of “Better Hearing Week,” including letters from President Roosevelt and New York Mayor LaGuardia. The 1920s publicity campaigns were primarily focused on fostering ties between otologists and the League, in cooperation with hospitals and schools. 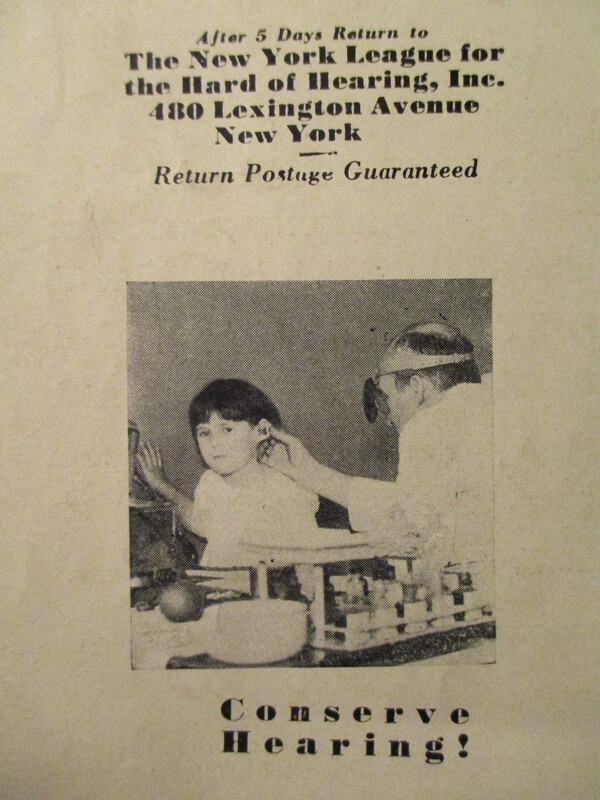 In 1927, the League purchased audiometers and offered invitations to conduct hearing tests in schools across New York, so children with hearing impairment could be assessed accordingly. Two years later, the League worked with Bell Laboratories to further substantiate the conviction that deafness was a serious problem amongst schoolchildren and that something needed to be done. At the same time otologists across America established joint ventures between organizations like the America Medical Association and the American Otological Society. They formed committees to write reports to the White House on the national importance of addressing the “prevention of deafness.” Wendell C. Phillips (1857-1934), another president of the League and the founder of ASHH, particularly emphasized the need to address the “psychologic conditions and mental reactions” of the deafened patient, for the tragedy of acquired deafness meant it is a “disability without outward signs, for the deafened person uses no crutch, no black goggles, no tapping staff.” It was an invisible handicap that needed to be made visible if it was to be prevented, if not cured. The Federation News, August 1935. Harold M. Hays, “Do Your Ears Hear?” Hygeia (April 1925). Wendell C. Phillips, “Reminiscences of an Otologist,” Hygeia (October 1930). 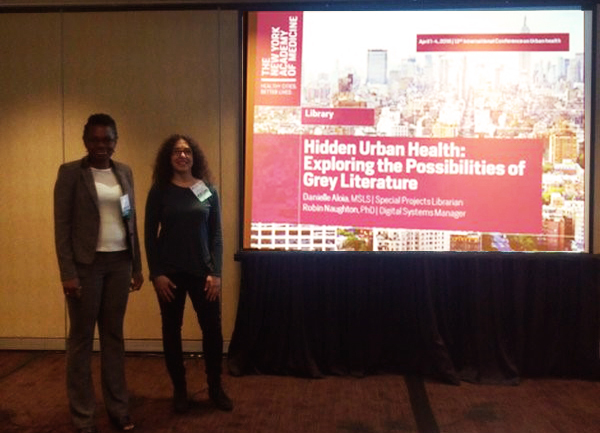 Danielle Aloia, Special Projects Librarian, and Robin Naughton, Digital Systems Manager, presented Hidden Urban Health: Exploring the Possibilities of Grey Literature on the Academy’s Grey Literature Report (GreyLit Report) in two sessions at the recent International Conference on Urban Health in San Francisco, April 1-4, 2016. 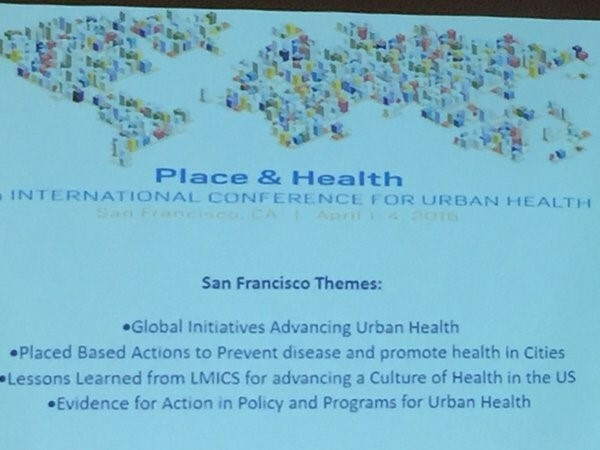 The conference focused on Place and Health and included a joint program with the American Association of Geographers. Combining data from geography with health data is one way to develop better models for urban and population health, and those involved in fields as diverse as urban planning, transportation, housing, and education all need to be at the table. Themes of the ICUH 2016 opening ceremony. Photo by Danielle Aloia. During the conference, two themes particularly relevant to the GreyLit Report emerged: the need for a better definition of urban health and the importance of interdisciplinary research. These are important concepts for the GreyLit Report when collecting and providing access to urban health resources, helping us to identify and understand topics that cross disciplines. We had an opportunity to appeal to the cross-disciplinary audience of researchers during two conference sessions, providing a brief explanation of what grey literature is and ways to search for it beyond traditional databases. In brief, grey literature is produced by think tanks, university centers, government agencies, and other organizations. It can be published as reports, fact sheets, data sets, white papers, and more. It provides current research on trending topics and is used to communicate findings to stakeholders and policy-makers. Robin Naughton and Danielle Aloia before a Hidden Urban Health: Exploring the Possibilities of Grey Literature session. Photo courtesy of ICUH. Some forms of grey literature can be found in traditional databases, such as PubMed or Web of Science, but the majority is not indexed or organized in systematic ways. To help solve this problem, the Academy Library developed the GreyLit Report in 1999 to collect these reports and make them accessible. During the presentations, we emphasized the importance the GreyLit Report places on interdisciplinary research. We collect reports related to public health in all sectors, to truly make a one-stop-shop for urban health. 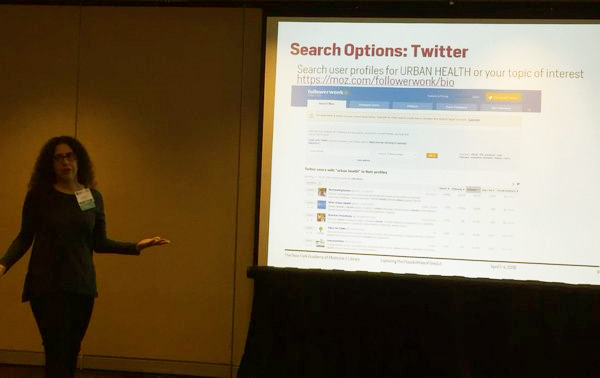 During the presentation, participants learned about Google Custom Search (using Google to search specific websites and document types), Twitter, and the GreyLit Report as three resources relevant to finding grey literature. Still, depending on the resource used for search, altering keywords may be necessary to get relevant results. What terms one discipline uses may be defined differently in another. For example, the word mobility can have multiple meanings. In urban health, it usually means how people get from place to place, but when searching Google or Twitter one can get results for mobile technologies and physical disabilities. We clarified that the terms used in searching are very important to the relevance of the results. Often, searches in Google and Twitter need to be weeded through to find relevant results. We also presented some criteria for evaluating such results: authority, credibility, affiliation, purpose, and conflict of interest. Danielle Aloia presenting at ICUH. Photo by Robin Naughton. The GreyLit Report is much easier to search than Google or Twitter. Because we collect, archive, and index reports from all sectors, its focus limits irrelevant results. Users do not have to wade through millions of results, but have a credible, authoritative selection from which to choose. At the end of each session, we opened up a conversation with participants to see what their concerns were in regard to grey literature and how the GreyLit Report may help them in their research. This produced an intimate, lively discussion. Participant concerns about grey literature included how to promote their own grey literature and ideas to enhance the Report. One idea is to add canned (one-click) searches on specific urban health topics. Another idea is to add the United Nations’ 17 Sustainable Development Goals with links to reports in those areas so that users can easily find grey literature for specific sustainable development goals in urban health. We will work on enhancing the GreyLit Report website, and more importantly, we will think about ways to help promote this growing body of research for users. Sonia Shah, today’s guest blogger, is a science journalist and author of Pandemic: Tracking Contagions from Cholera to Ebola, and Beyond (Sarah Crichton Books/Farrar, Straus & Giroux, February 2016), from which this piece, including illustrations, is adapted. On February 23 at 6pm, Shah will moderate the panel “Where Will the Next Pandemic Come From?,” cosponsored by the Pulitzer Center on Crisis Reporting. Register to attend. Over the past 50 years, more than 300 infectious diseases have either newly emerged or re-emerged into territory where they’ve never been seen before. The Zika virus, a once-obscure pathogen from the forests of Uganda now rampaging across the Americas, is just the latest example. It joins a legion of other diseases that have similarly broken out of earlier constraints, including Ebola in West Africa, Middle East Respiratory Syndrome (MERS) in the Middle East, and novel avian influenzas in Asia, one of which hit the U.S poultry industry last spring, causing the biggest animal disease epidemic in U.S history. When such pathogens spread like a wave across continents and global populations, they cause pandemics, from the Greek pan (“all”) and demos (“people”). Given the number of pathogens in our midst with pandemic-causing biological capacities, pandemics themselves are relatively rare. In modern history, only a few pathogens have been able to cause them: Yersinia pestis, which causes bubonic plague; variola, which causes smallpox; influenza A; HIV; and cholera. Cholera is one of the history’s most successful pandemic-causing pathogens. The first cholera pandemic began in the Sundarbans in present-day Bangladesh in 1817. Since then, it has ravaged the planet in no fewer than seven pandemics, the latest of which is currently smoldering just a few hundred miles off the coast of Florida, in Haiti. Cholera first perfected the art of pandemics by exploiting the rapid changes in transportation, trade, and demography unleashed by the dawn of the factory age. New, fast-moving transatlantic clipper ships and sailing packets, which moved millions of Europeans into North America, brought cholera to the New World in 1832. Thanks to the opening of the Erie Canal in 1825, the bacterial pathogen easily spread throughout the country, including into the canal’s southern terminus, New York City, which suffered repeated cholera epidemics over the course of decades. The spread of cholera after the opening of the Erie Canal. Cholera was well-poised to exploit the filth of 19th-century cities. The pathogen spreads through contaminated human waste. And outhouses, privies, and cesspools covered about 1/12 of New York City, none of which were serviced by sewer systems and few of which were ever emptied. (Those that were had their untreated contents unceremoniously dumped into the Hudson or East Rivers.) The contents of countless privies and cesspools spilled out into the streets, leaked into the city’s shallow street-corner wells, and trickled into the groundwater. Even those who enjoyed piped water were vulnerable to the contagion. The company chartered by New York State to deliver drinking water to the city’s residents—the Manhattan Company, which started a bank now known as JPMorgan Chase—dug their well among the tenements of the notoriously crowded Five Points slum, in what is today part of Chinatown. They delivered the slum’s undoubtedly contaminated groundwater to one third of the city’s residents. The 1832 cholera outbreak in New York City. The Manhattan Company, now JP Morgan Chase, sank its well amidst the privies and cesspools of the Five Points slum, atop the site of the Collection Pond, which had been filled in with garbage. The water was distributed to 1/3 of the city of New York. Just as the Zika and MERS viruses confound modern-day medicine, so too did cholera confound 19th-century medicine. Under the 2,000-year-old spell of miasmatism—the medical theory that diseases spread through stinky airs, or miasmas—doctors couldn’t bring themselves to admit that cholera spread through water, despite convincing contemporary evidence that it did. But that doesn’t mean there was nothing that could have been done to mitigate the cholera pandemics of the 19th century. And New York’s physicians knew that cholera was coming down the Erie Canal and the Hudson River, heading straight for the city. Dr Lewis Beck, who collected the data mapped above admitted that the pattern of disease did “favor the idea that cholera is contagious,”3 and travelling down the waterways into New York City. So many people feared the migrants coming down the waterways during cholera outbreaks that residents of towns lining the canal refused to let passengers on passing boats disembark. In 1893, in fear of a cholera outbreak, an armed mob surrounded the cholera-infected passengers of the Normannia, a vessel recently arrived from Hamburg, Germany, trapping hundreds aboard for days. But despite the public’s fears of contagion and contaminated water, little was done to protect the city from either. The city’s leadership refused to enact quarantines along the canal or the Hudson for fear of disrupting the lucrative shipping trade that had transformed New York from a backwater to the Empire State. The Manhattan Company retained its charter, despite public outcry about the quality of their water. The political machinations of the infamous Aaron Burr, pursuing his murderous rivalry with the now-storied founding father Alexander Hamilton, assured that. Instead, each wave of deadly contagion was met with minor adjustments to society’s defenses against pathogens. International conferences began in 1851 to organize cross-border quarantines against cholera and other diseases. New York City opened its first independent health department, staffed by physicians rather than political appointees, in 1865, as cholera loomed (thanks in large part to the efforts of the New York Academy of Medicine). These reactive, incremental measures couldn’t stave off nearly a century of deadly cholera pandemics, but as the decades passed, they formed the foundation for the global health system we enjoy today. Following New York City’s example, independent health departments were built across the country. The international conferences to tame cholera led to the formation of the World Health Organization, in 1946. Today, we continue to fight contagions in a similarly reactive, incremental fashion. After Ebola infected tens of thousands in West Africa and elsewhere, hospitals in the United States and other countries beefed up their investments in infection control. After mosquito-borne Zika infected millions across the Americas, public health agencies focused anew on the problem of disease-carrying insects. Whether these measures will be sufficient to defuse the next pandemic remains to be seen. But a more comprehensive, proactive approach to defanging pandemics is now possible, too. The history of pandemics reveals the role of human activity in the emergence and spread of new pathogens. Industrial developments that disrupt wildlife habitat; rapid, ad hoc urbanization; intensive livestock farming; sanitary crises; and accelerated trade and travel all play a critical role, just as they did in cholera’s heyday. In some places, we can diminish the pathogenic threat these activities pose. In others, we can step up surveillance for new pathogens, using new microbial sleuthing techniques. And when we find the next pandemic-worthy pathogen, we can work to contain it—before it starts to spread. 1. Pandemic, p 64. From Koeppel, Gerard T. Water for Gotham: A history. Princeton University Press, 2001, 121, 141. 2. Pandemic, p 63. from Blake, Nelson Manfred. Water for the cities: A history of the urban water supply problem in the United States. No. 3. Syracuse University Press, 1995, 126. 3. Pandemic, p 106. from Tuite, Ashleigh R., Christina H. Chan, and David N. Fisman. “Cholera, canals, and contagion: Rediscovering Dr Beck’s report.” Journal of public health policy 32.3 (2011): 320-333. This month, the Boy Scouts of America celebrated its 106th birthday. 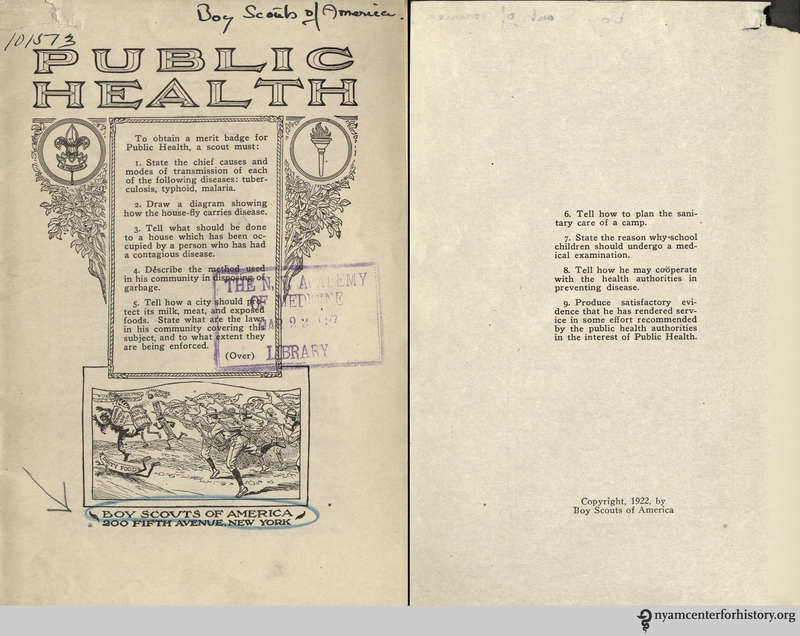 To mark the occasion, we are featuring at a pamphlet from our collection, called simply Public Health. The cover and inside cover of Public Health, 1922. Click to enlarge. A close-up of the cartoon on the cover of Public Health, 1922. While many of the same public health issues have remained at the forefront since 1922, our means of responding to them have progressed. If there is still a test for a public health merit badge in another 94 years, one hopes that the questions will reflect even more advances in prevention and control of disease. 1. Public Health. 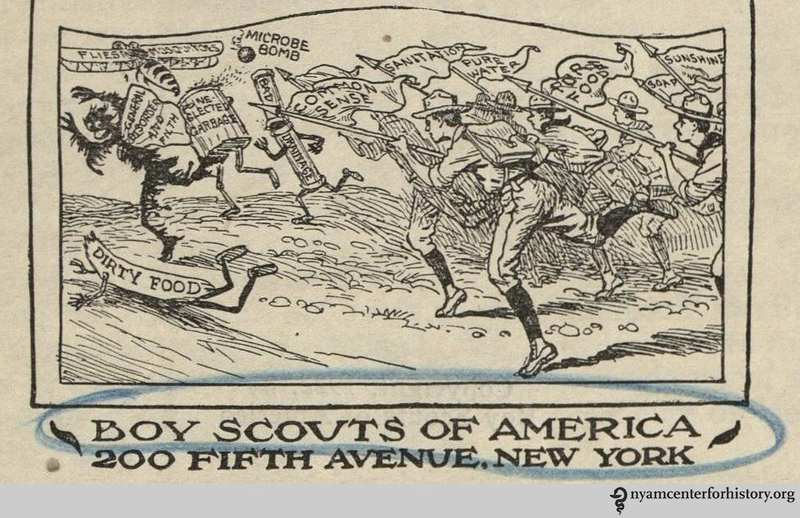 Boy Scouts of America; 1922. 2. Public Health. Available at: http://www.scouting.org/Home/BoyScouts/AdvancementandAwards/MeritBadges/mb-PUBH.aspx. Accessed February 10, 2016. 3. Achievements in Public Health, 1900-1999 Impact of Vaccines Universally Recommended for Children — United States, 1990-1998. MMWR Wkly. 1999;48(12):243–248. Available at: http://www.cdc.gov/mmwr/preview/mmwrhtml/00056803.htm#00003752.htm. Accessed February 10, 2016. 4. Vaccines: VPD-VAC/Childhood VPD. Available at: http://www.cdc.gov/vaccines/vpd-vac/child-vpd.htm. Accessed February 10, 2016. Does one have a “right to health”? And if so, what does that right entail? Access to healthcare? Access to all healthcare? Equality of health outcomes? “Necessary to Efficient Democracy,” the way that experience in schools and other institutions is brought to the public, in Allen, Civics and Health, 1909, p. 310. According to Allen, it was not that people did not know what to do to secure public health—for the most part they did. It was rather that the means were often shunted aside, a problem of enforcement—and hence his argument for health as a right! Allen looked to find the most practical way to correct health deficiencies, and as co-director of the city’s newly established Bureau of Municipal Research, he looked upon all of New York as a test site.8 Here, he turned his attention to the health of school children, “the best index to community health.”9 Determining the status of children’s health was a comprehensive way of judging the health of the whole community, as children from all ranks of the community were available to reformers, and the mechanisms were already in place to examine and collect data. Allen saw children’s health as the indicator, not just to the health of the city, but to the right to health. Much of his book was devoted to measuring as well as intervening in children’s health, in such ways as enforcing milk purity laws, quarantines for communicable diseases, and vaccination for smallpox. He was concerned with controlling germs, paying attention to eye and ear health, and promoting school play and physical education. He saw the health of teachers as crucial to that of their charges. And, as detailed in our earlier blog post, he supported removal of tonsils and adenoids. Many of Allen’s practical ideas today seem commonplace in the wake of the great shifts in public health that took place in the 20th century. But one thing stands out: seeing health as a right brought it out of the realm of enlightened self-interest and humanitarian relief. Health became social, health became enforceable, health became a right. That legacy, contested though it now is in American society, remains present today. 1. World Health Organization, Fact Sheet No. 323, “The Right to Health,” reviewed November 2013, http://www.who.int/mediacentre/factsheets/fs323/en/#, accessed September 23, 2015. 2. United Nations, “Universal Declaration of Human Rights,” Article 25, http://www.un.org/en/documents/udhr/, accessed September 23, 2015. 3. For the UN Millennium Development Goals, see http://www.un.org/millenniumgoals/, accessed September 23, 2015; for a summary of international conventions, see Mervyn Susser, “Health as a Human Right: An Epidemiologist’s Perspective on the Public Health,” American Journal of Public Health 1993 March; 83 (3): 418–26. 4. William Harvey Allen, Civics and Health, with an introduction by William T. Sedgwick (Boston, New York, Chicago, and London: Ginn and Company, 1909). For information on Allen (1874–1963), see in addition to the Recchiuti book below: “Reminiscences of William Harvey Allen: oral history, 1950,” Columbia Center for Oral History, http://oralhistoryportal.cul.columbia.edu/document.php?id=ldpd_4072329. 5. Allen, Civics and Health, pp 11–22. The seven motivations are Instinct, Display, Commerce, Anti-Nuisance, Anti-Slum, Pro-Slum [Abatement], and Rights. 6. Allen, Civics and Health, 20. 7. Allen, Civics and Health, 20. 8. For Allen and the Bureau of Municipal Research, see John Louis Recchiuti, Civic Engagement: Social Science and Progressive-Era Reform in New York City (Philadelphia: University of Pennsylvania Press, 2006), Chapter 4, pp. 98–124. 9. The phrase comes from the title of Chapter 4, “The Best Index to Community Health is the Physical Welfare of School Children,” page 33. 10. Allen, Civics and Health, Part III, “Coöperation in Meeting Health Obligations,” and Part IV, “Official Machinery for Enforcing Health Rights.” For an earlier attempt at a national bureau of health, see Jerrold M. Michael, “The National Board of Health: 1879–1883,” Public Health Reports 2011 Jan-Feb; 126(1): 123–29. As the school year came to a close in June 1906, a panic swept through New York’s Lower East Side. According to newspaper reports, hundreds of parents, mostly Eastern European immigrants, ran to about a dozen local schools believing that their children were going to be harmed or murdered by doctors. Some people broke windows, some hit school workers, many yelled and cried and all demanded to see their children. At each school, children were eventually dismissed early, and, to the great relief of the frightened parents, were unharmed. A similar course of events took place in Brownsville, Brooklyn the next day.1 These events came to be known as the “adenoid riots” because they occurred a week after students had undergone surgeries, apparently without incident, to remove enlarged adenoids at Public School 110 in the Lower East Side. What caused the riots? Most accounts of the time blamed the immigrant population, stating that they were subject to panics, suspicious and ignorant of modern medical practice, and incensed and saddened by recent news of the Bialystok pogroms. Reporters also commented that local doctors intentionally spread rumors that children were being harmed because they saw free school and city services as a threat to their business. Modern scholars, sympathetic to the immigrant’s perspective, have analyzed the events as a reaction against coercive means of assimilation.2 Yet while “Americanization” certainly played a role in this health initiative, school medical inspection affected children of all classes and ethnic groups in the United States and abroad. The confusion, fear, and misunderstanding of the adenoid riots was caused, in part, by erroneous beliefs about the implications of enlarged adenoids (masses in the back of the nasal cavity that can help fight infection), the methods used in NYC, and the zealousness of the hygienists to find and root out adenoids. “Mouth breathing means adenoids; adenoids mean deadened intellects.” In Gulick and Ayres, Medical inspection of schools, 1917 (2nd ed. ), p. 4. By the early 1900s, many involved in the growing school hygiene movement in the United States were convinced that enlarged adenoids were a common impediment to learning. 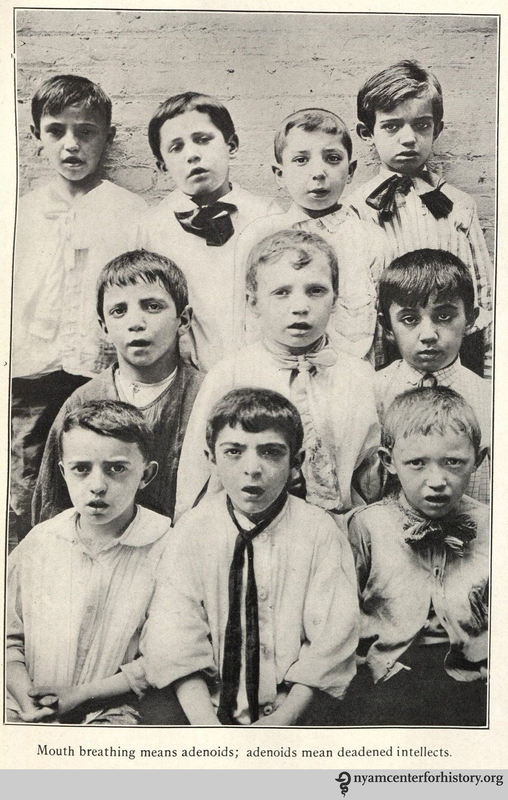 In 1905 New York City became one of the first cities to inspect students for enlarged adenoids along with ear, nose, and throat problems. This more thorough physical examination was added to examinations for contagious diseases that had taken place since the 1890s in a number of cities. “Mouth breathers before ‘adenoid party. '” In Allen, Civics and health, 1909, p. 55. Chief Medical Inspector of the New York City Department of Health, Dr. John C. Cronin, spearheaded the expanded medical inspection. He claimed that at PS 110, 137 children out of 150 in a specialized class of so-called “backward,” “incorrigible,” and “truant” children had enlarged adenoids.5 As the end of the school year approached, 56 children had had them removed, with 81 remaining. Cronin arranged to have the students convalesce in the countryside with the Society of Improving the Condition of the Poor at the end of the school year. Yet Cronin also wrote later that “it was then thought justifiable to get information as to what scholastic results would be obtained if these children were operated on collectively.”6 Seemingly frustrated, he brought in three doctors from Mount Sinai hospital to perform the operations at the school, after obtaining permission slips from parents. Cronin stated that doctors performed operations on 81 children in 84 minutes.7 While it was typical to do these surgeries quickly and without anesthesia or after care, these operations were done at an exceedingly rapid pace. From various accounts, children left the schools bleeding profusely. The riots occurred a week later. “Mouth breathers immediately after ‘adenoid party. 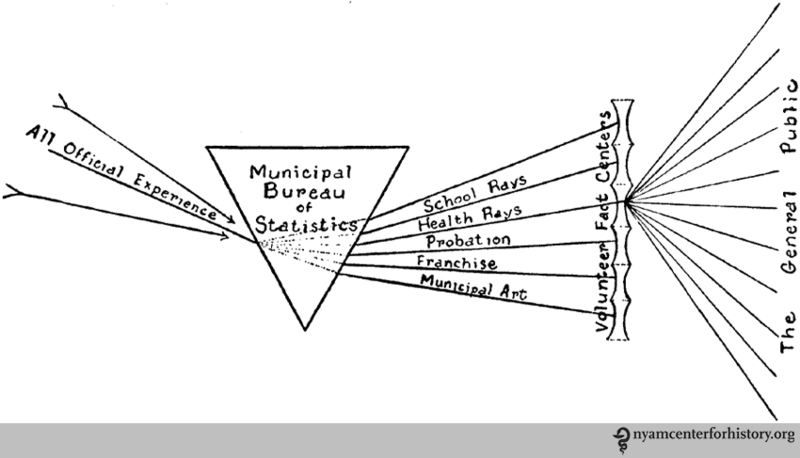 '” In Allen, Civics and health, 1909, p. 46. Despite the rioting, Cronin publicized the efforts at PS 110 as an outright success. He held that all but four of the students had significant mental and physical improvement. He wrote: “From dullards, many of them have become the brightest among their fellows, after the operation.”8 A New Jersey doctor commented that removal of adenoids “has been followed by such wonderful improvement of the body and mind as to make recital sound like romance. The story of public school No. 110 in New York City, is almost beyond belief except to those who are familiar to it.”9 Medical and educational journals were filled with accounts of transformation through adenoid surgeries, many referencing PS 110. As they preached their belief in transformation through surgery, these doctors and hygienists continually bolstered the idea that presence of enlarged adenoids caused poor scholarship and deviance. This association is clear when looking at hygiene statistics. When medical inspections took place in Northeastern urban centers, adenoids were found in roughly 30% of students. However, when the students were in a reformatory or a specialized class, like the students at PS 110, numbers climbed to 90%. “Throat inspection in the Orange, N. J. schools.” In Gulick and Ayres, Medical inspection of schools, 1917 (2nd ed. ), p. 148. During the 1910s, the faith that experts had in the radical transformation of students through adenoidectomy began to wane. 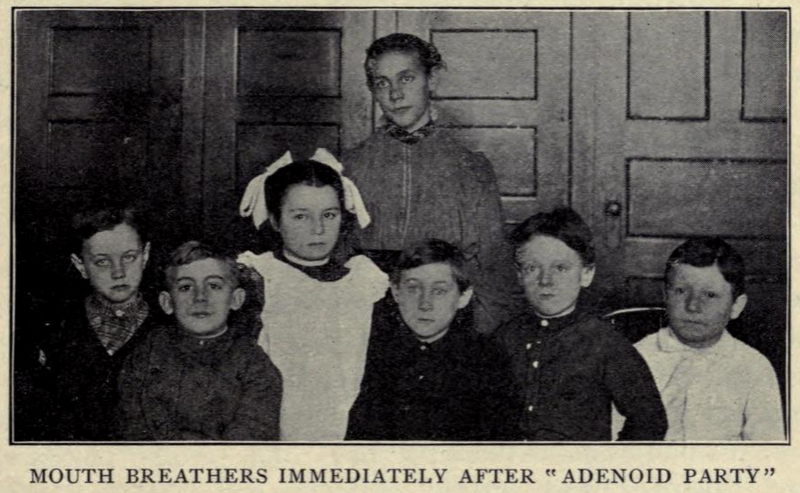 Walter Cornell, a leading advocate of the surgeries, found that his study group did not succeed academically after the surgeries as was expected, and wrote in 1912 that this case “certainly explodes the theory that the removal of adenoids is the panacea for all juvenile delinquencies.”11 Others began to see similar results. 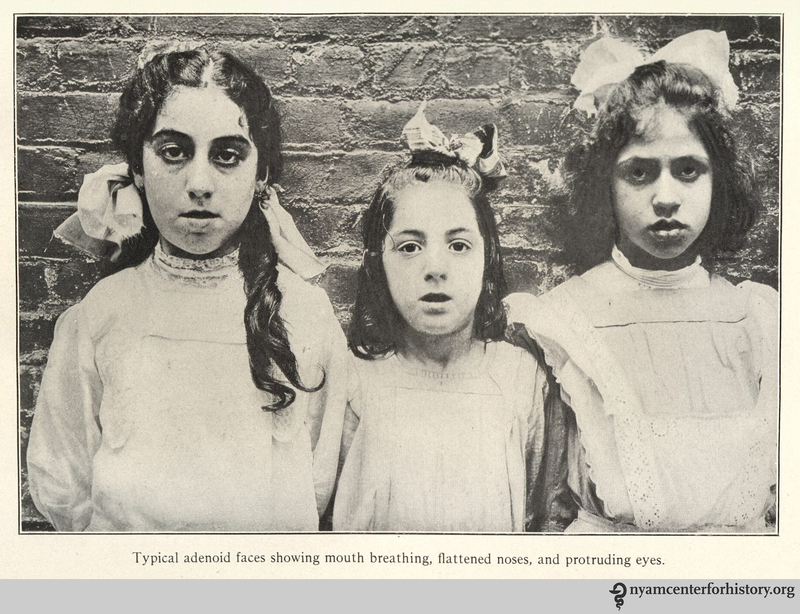 “Typical adenoid faces showing mouth breathing, flattened noses, and protruding eyes.” In Gulick and Ayres, Medical inspection of schools, 1917 (2nd ed. ), p. 170. For school and city authorities, adenoid surgeries were an appealing, cheap, convenient way to reform education by changing the child, rather than overhauling the educational system. It is not surprising that they were overdiagnosed or misdiagnosed. 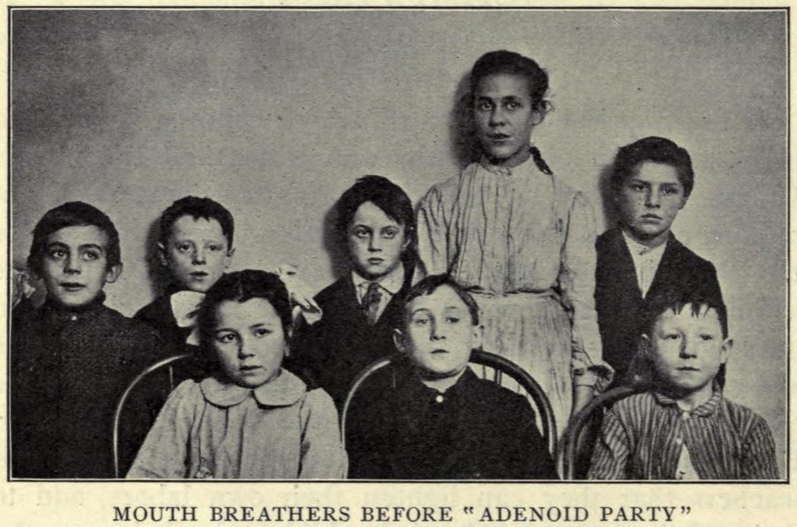 While the adenoid riots took place at the beginning of the “adenoid craze,” they illustrate a general suspicion of these new hygiene practices and of the school’s new role in public health. 1. 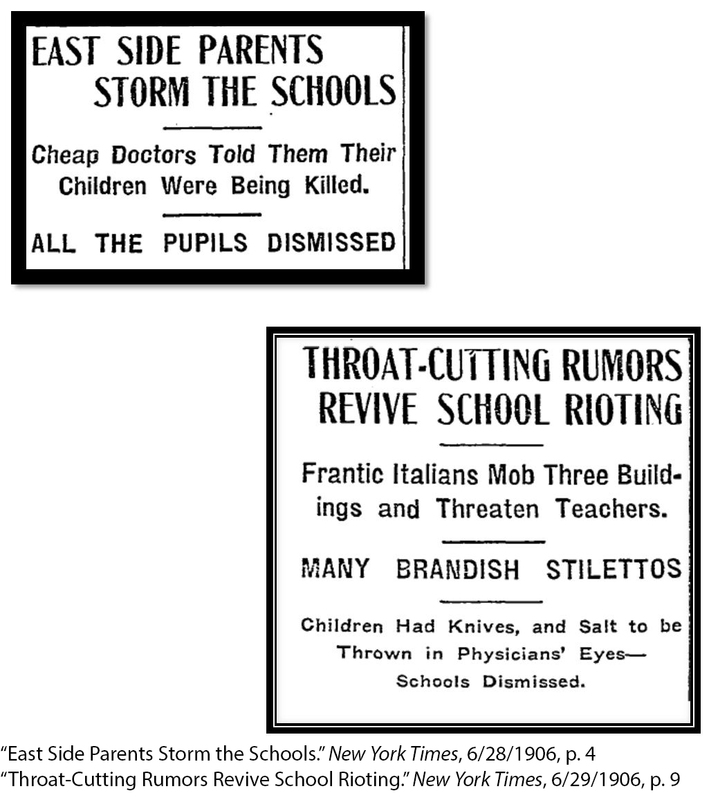 “East Side Parents Storm the Schools,” New York Times, 28 June 1906, pg. 4; “Throat-Cutting Rumors Revive School Rioting,” New York Times, 29 June 1906, pg.9. 2. For an interesting view of the adenoid riots, see Alan Kraut, Silent Travelers: Germs, Genes and the Immigrant Menace (Baltimore: Johns Hopkins University Press, 1994). 3. A.A. Guye, “On Aprosexia, Being the Inability to Fix the Attention and other Allied Alterations of the Cerebral Functions caused by Nasal Disorders,” Journal of Laryngology and Rhinology 3 no.11 (December, 1889):499-506. 4. For example, see Macleod Yearsley, Adenoids (London: The Medical Times, 1901); 39-74; W.E. Casselberry, “Facial and Thoraic Deformities Incident to Obstruction by Adenoid Hypertrophy in the Naso-Pharynx,” Journal of the American Medical Association 15 no. 12(September 20, 1890): 417-420; W.L. Grant, “Some Common Conditions of the Nose and Naso-Pharynx Demanding Operative Interference,” Philadelphia Medical Journal 2 no.16(October 15, 1898):798-799; Allen T. Haight, “Naso-Pharyngeal Adenoids as a Causative Factor in Ear Diseases,” Journal of the American Medical Association 33 no. 26 (December 23, 1899): 1577-1578. 5. John J. Cronin, “The Physical Defects of School Children,” The Journal of the New York Institute of Stomatology 2 no. 4(December, 1907):280. 7. 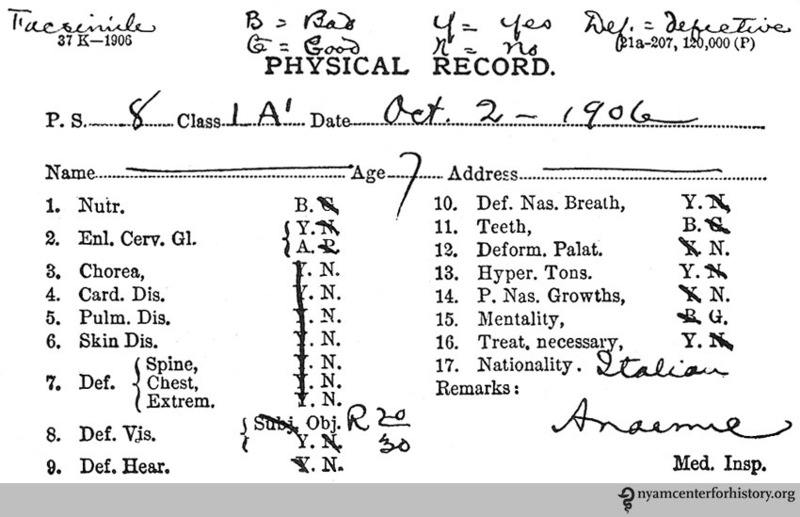 “Medical Attention in Public Schools,” American Gymnasia and Athletic Record 3 no. 6(February, 1907):125. 8. John J. Cronin, “The Doctor in the Public School” The American Monthly Review of Reviews 35 no. 4 (April, 1907): 438. 9. F.C. Jackson, “The Medical Supervision of Schools” The New Jersey Review of Charities and Corrections 7 no. 3 (March, 1908): 84. 10. Luther Gulick and Leonard Ayres, Medical Inspection of Schools (New York: Russell Sage, 1909, ed. ), 102; Florence A. Sherman, “Medical Inspection in Bridgeport (Conn.) Public Schools,” Fourth International Congress on School Hygiene 4(August, 1913):394; Mrs. Edward W. Hooke, “To Save All Babies,” The American Club Woman 10 no. 6(December, 1915):117. 11. Walter Cornell, Health and Medical Inspection of School Children (Philadelphia: F.A. Davis Company, 1912), 278. 12. A Bureau of Child Hygiene: Co-operative Studies and Experiments by the Department of Health of the City of New York and the Bureau of Municipal Research (Bureau of Municipal Research, 261 Broadway: September, 1908): 13.